Sharjah24 - WAM: The Saudi-led Arab Coalition supporting the legitimate government in Yemen announced early Saturday that it launched an operation destroying a network of drone capabilities of the Houthi militia in a camp at the presidential palace area in Sanaa. Sharjah 24 – Reuters: Hundreds of thousands of protesters massed around a sit-in outside Sudan's Defence Ministry on Friday to demand that the military council that ousted former president Omar al-Bashir last week hand over power to civilians. 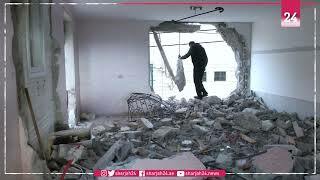 Sharjah 24: Israeli occupation forces destroyed two apartments in the occupied West Bank on Friday that housed the family of a Palestinian accused of killing an Israeli occupation woman in February, the army said. 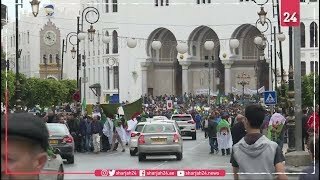 Sharjah 24 – Reuters: Hundreds of thousands of demonstrators returned to Algeria's streets on Friday to press demands for sweeping democratic change well beyond former President Abdelaziz Bouteflika's resignation, chanting "we do what we want", witnesses said. 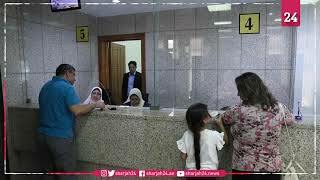 Sharjah 24 – WAM: Egypt's state news agency said expats have started voting on constitutional amendments that would allow President Abdel-Fattah el-Sissi to stay in power until 2030. Sharjah24 – Reuters: The United States supports a democratic and peaceful transition in Sudan led by civilians who represent all Sudanese, the State Department said on Thursday, as protesters in Khartoum kept up demands that the country's military hand over power to civilians. Sharjah 24 – WAM: Israeli occupation forces early Thursday arrested 12 Palestinians in various West Bank cities, according to the Palestinian Prisoners Society. Sharjah 24 – Reuters: Egypt’s election commission said on Wednesday that a referendum potentially allowing President Abdel Fattah el-Sisi to stay in office until 2030 will take place on April 20-22. 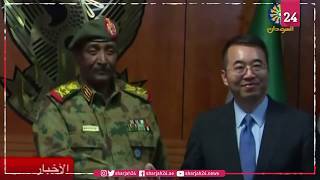 Sharjah 24 - Reuters: The Sudanese leader and deputy leader of the country's new Transitional Military Council (TMC) met on Tuesday with representatives from China, Britain and the Netherlands. Sharjah24 – WAM: Kuwait has renewed its call for all Yemeni parties to fully implement the Stockholm Agreement on Hodeidah and its three ports, as well as the agreement on the exchange of prisoners, and the Taiz memorandum of understanding.